Hope you all have a great day! I just put the bird on the BGE to smoke with pecan. Our turkey stock is back on the stove after being de-fatted. It is the consitency of jello. I love turkey jell-o. Our turkey is still in its salt bath. Four desserts made and prep done for the rest of the meal. Just need to roast the bird and make the stuffing and a side. Happy Thanksgiving, friends! I hope you all have a wonderful day! 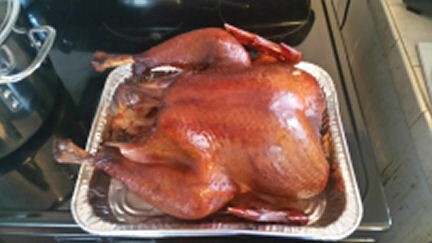 I brined ours Tuesday evening, pulled it out late last night to dry in the fridge. I pulled it from the fridge to warm up at 5:00 AM. It went on the Egg just before I started the thread. Now I'm going to start chopping vege for the dressing and summer squash casserole. All I really need to do is roast the bird and make the gravy. DD and I have been prepping this meal for 2 days so all we really need to do is warm or assemble everything else. We DID have one culinary mishap. More on that later. I wish you all a Wonderful Day filled with Good Food, Laughter and Love. Not as deep a mahogany color as birds done on the offset, but that smokey aroma is on point. That was worth every last bit of effort! Its a good thing STARTED with pie! Leftovers.... A big regret of our going to a restaurant is, no leftovers..